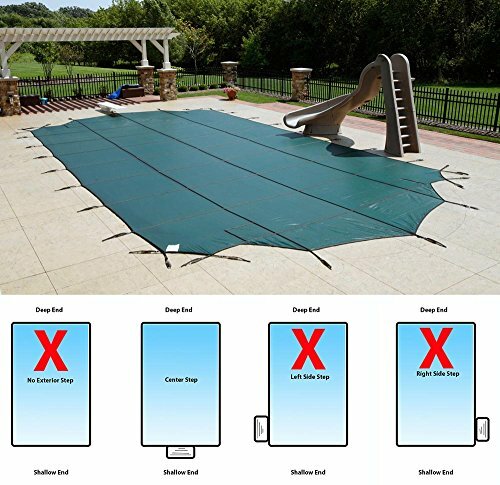 Protect your in-ground swimming pool, pets and family with the Arctic Armor Super Mesh Pool Cover with Step Entry Section- the finest mesh safety pool cover you can buy! The attractive Super Mesh is made from exceptionally tough strands, making it stronger than standard mesh material and better able to withstand heavy snow loads and extreme wind. Rugged stainless steel dual springs provide added strength and will not become sprung under the weight of snow and ice. The super tight weave produces almost total shade, blocking the suns algae-producing rays for a virtually algae-free pool in spring. This weave also allows water to seep through the cover, but filters out the finest debris. Since almost no dirt or algae enter your pool, spring opening is quicker and easier! This lightweight cover is easy to install and remove and features U.V. stabilizers so itll remain like new after years of harsh sunlight. 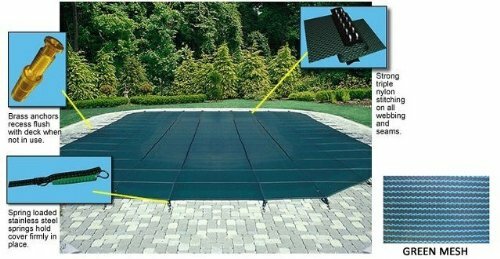 The Super Mesh comes complete with everything you need for installation, features a 4ft x 8ft left step section for pools with center step entry systems and is backed by the manufacturers 15-year warranty! Protect your in-ground swimming pool, pets and family with the Arctic Armor Mesh Safety Pool Cover. These tough, long-lasting pool covers are strong enough to support your entire family, yet light enough to place atop or remove from your pool in under five minutes! Arctic Armor covers are made of super-strong two-ply mesh with a break strength of over 4,000 lbs! This resilient cover is held in place by brass anchors that, when the cover is not in use, recess flush with the deck for improved safety and appearance. Completely protect your family and pets from accidental drowning with this exceptionally tough, hard-wearing safety cover. In addition to its safety features, Arctic Armor affords excellent winter protection for your pool. Its fine, lightweight mesh allows rain to seep through but screens out leaves and debris. Spring clean up is a snap because no water collects on the pool covering. The cover comes complete with brass anchors, stainless-steel springs, installation tool and storage bag. This outstanding cover is backed by the manufacturers 12-year warranty! 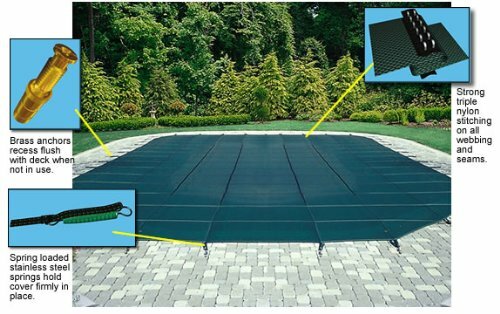 Protect your in-ground swimming pool, pets and family with the Arctic Armor Mesh Safety Pool Cover. 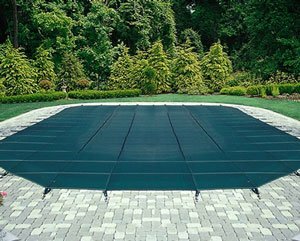 These tough, long-lasting pool covers are strong enough to support your entire family, yet light enough to place atop or remove from your pool in under five minutes! Arctic Armor covers are made of super-strong two-ply mesh with a break strength of over 4,000 lbs! This resilient cover is held in place by brass anchors that, when the cover is not in use, recess flush with the deck for improved safety and appearance. Completely protect your family and pets from accidental drowning with this exceptionally tough, hard-wearing safety cover. In addition to its safety features, Arctic Armor affords excellent winter protection for your pool. Its fine, lightweight mesh allows rain to seep through but screens out leaves and debris. Spring clean up is a snap because no water collects on the cover. The cover comes complete with brass anchors, stainless-steel springs, installation tool and storage bag. This outstanding cover features a 4ft x 8ft center step section and is backed by the manufacturers 12-year warranty! Protect your in-ground swimming pool, pets and family with the Arctic Armor Mesh Safety Pool Cover. These tough, long-lasting pool covers are strong enough to support your entire family, yet light enough to place atop or remove from your pool in under five minutes! Arctic Armor covers are made of super-strong two-ply mesh with a break strength of over 4,000 lbs! This resilient cover is held in place by brass anchors that, when the cover is not in use, recess flush with the deck for improved safety and appearance. Completely protect your family and pets from accidental drowning with this exceptionally tough, hard-wearing safety cover. In addition to its safety features, Arctic Armor affords excellent winter protection for your pool. Its fine, lightweight mesh allows rain to seep through but screens out leaves and debris. Spring clean up is a snap because no water collects on the cover. The cover comes complete with brass anchors, stainless-steel springs, installation tool and storage bag. This outstanding cover is backed by the manufacturers 12-year warranty! Protect your in-ground swimming pool, pets and family with the Arctic Armor Mesh Safety Pool Cover. These tough, long-lasting pool covers are strong enough to support your entire family, yet light enough to place atop or remove from your pool in under five minutes! Arctic Armor covers are made of super-strong two-ply mesh with a break strength of over 4,000 lbs! This resilient cover is held in place by brass anchors that, when the cover is not in use, recess flush with the deck for improved safety and appearance. Completely protect your family and pets from accidental drowning with this exceptionally tough, hard-wearing safety cover. In addition to its safety features, Arctic Armor affords excellent winter protection for your pool. Its fine, lightweight mesh allows rain to seep through but screens out leaves and debris. Spring clean up is a snap because no water collects on the pool covering. The cover comes complete with brass anchors, stainless-steel springs, installation pool and storage bag. This outstanding cover features a 4ft x 8ft center step section and is backed by the manufacturers 12-year warranty! Copyright © Wholesalion.com 2019 - The Best Prices On Arctic Armor Super Mesh Online.